Associations define relationship between Classes. Whenever you need some additional information on that relationship an association class will come in handy. Even if the Association class is mostly used for many to many relationships, you can just as well use them on association of any cardinality. 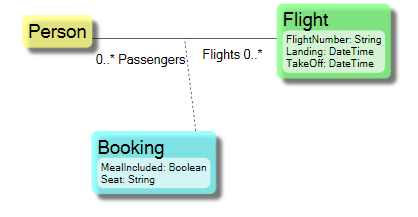 OR-mapping (the process of taking an object oriented model (a standard UML class diagram) and transform it to a relational database schema (tables, fields, primary and foreign keys) ) will turn this model into three tables; one to store Person, one to store Flight and one to store Booking. 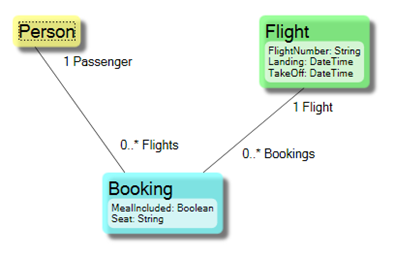 If you had not used the association class, OR-mapping would still create three tables due to the many to many association. The third table would store two foreign keys, one to identify the Person and one to identify the Flight. The third table would implicitly be named, if you did not explicitly give it a name, to PersonFlight or FlightPerson. This table the DB-guys often refer to as a link table. This will also end up in the database as three tables where Booking points out Person and Flight with one foreign key for each. So for a DB-centric-guy this is the same… To a OO-Guy this is NOT the same. 2. Uniqueness; In UML one instance must be unique in the relation, you cannot add one person to a flight twice. This way the use of the association class has effectively given the UML reader the information that a person can only be one passenger at a time and not two. So whenever you see the need for lifetime control and uniqueness you should use the association class. It will help the reader and it will help the developer – the db-guy will not know the difference but then again they seldom do. this is a very important feature, as there are so many things in this world that are described by adding information to the relation rather than any of the end point. Having the framework managing the life cycle of the relation-information is incredibly useful. A while back I was discussing this with Daniel Simmons, Dev Manager for Entity Framework, when trying to understand what kind of support EF offers in this regard. Unfortunately none in EFv1 and none in EFv2. Read the entire conversation here: http://social.msdn.microsoft.com/forums/en-US/adodotnetentityframework/thread/727e4996-6a40-43dc-a60a-ca1575dc327b/. Having a framework-managed association class allows for incredibly cool things over and beyond "Employment" and "The role of a contact person". For instance the role of a consultant in a project - as well as the hourly fee - can be tucked in there, and then used when calculating invoices, monthly time reports and so on.